"Aimed at the do-it-yourselfer, this easy-to-follow book presents quick and simple ways to frame a work of art"-the publisher. Since the cost of framing often exceeds the price of the artwork itself, it pays to know how to do it yourself. 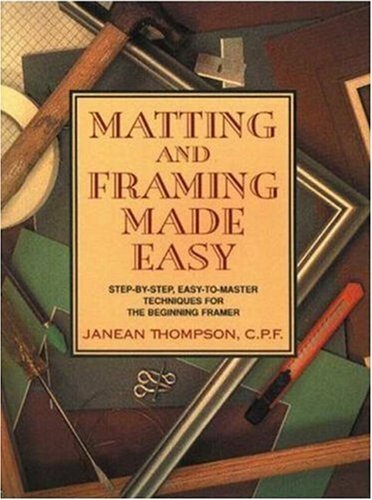 This book offers thorough background on all the basics--measuring, mounting, matting, glazing materials, and frames--for both archival and non-archival techniques. Even if you're not ready to invest in specialty tools like a mat cutter or miter box, you'll find useful instructions on working with ready-made frames using simple tools (a ruler and utility knife). In addition to coverage of traditional artwork, directions are provided for specialty items, such as tiles and needlework, and for incorporating slightly dimensional items on the mat to accent the framed piece.